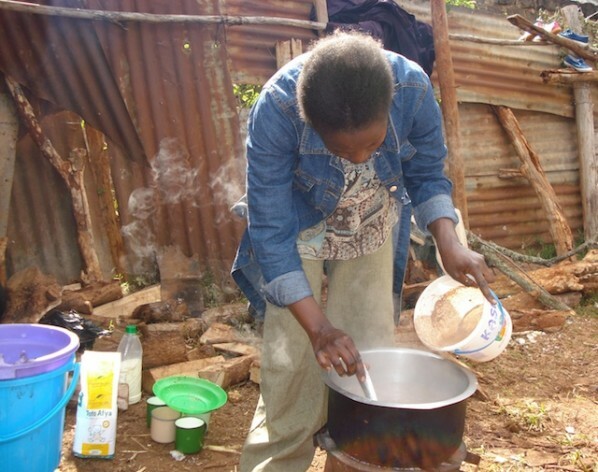 NAIROBI, Feb 10 2014 (IPS) - Jane Njeri from the semi-arid lower Mukurweini district in Kenya’s Central Province has taken to boiling wild roots to feed her five children. Her children, all of whom are under the age of 10, are too young to understand why there is no food on the table. “At night they refuse to sleep on an empty stomach so I tell them that I am boiling arrowroots. They know that arrowroots take a long time to cook, so they wait patiently until they eventually fall asleep beside the fading fire,” she told IPS. According to the regional Drought Management Authority, lower Mukurweini has only been receiving 200 mm of annual rainfall, which has resulted in a dire food shortage. But Mukurweini is not the only region in the midst of drought and food shortages. Arid areas are the most affected, particularly Turkana County in Rift Valley Province, where half of the residents – about 400,000 people – are facing starvation. The Kenya Agricultural Research Institute (KARI) says that in total at least one quarter of the 41 million people in this East African nation lack sufficient food and 1.7 million are under threat of hunger and starvation. According to the Famine Early Warning Systems Network, aside from a few areas, no part of the country is food secure as this season’s harvest of maize – the country’s staple food – was not enough to feed the nation. The Food and Agricultural Organisation of the United Nations says the country is short of about 10 million bags of maize and warned that the drought is expected to reach its peak in August. But agricultural researchers like Professor Mary Abukutsa-Onyango have blamed an over reliance on rain-fed agriculture for the shortage. According to the ministry of agriculture, less than seven percent of cropped land here is under irrigation and the government’s plan to place half a million hectares under irrigation, particularly in arid and semi-arid areas, has not made sufficient progress. It’s a sad development as last September, the government discovered an estimated 250 billion cubic metres of freshwater – enough to supply the country for 70 years – in Turkana County. Abukutsa-Onyango added that there was also too much focus on maize as a staple crop. “We are not growing other crops such as sorghum, finger millet, arrow roots, yams and bambara nuts as well as indigenous fruits and vegetables which can grow easily in many parts of the country, creating alternative sources of food,” she said. Food security expert Winnie Mapenzi told IPS that small-scale farmers, who produce three-quarters of the country’s food, have been unable to produce enough to feed the nation due to various challenges. Limited financing to the agricultural sector has also been blamed for the poor food production. In 2003, Kenya was among the 53 African countries who signed the Comprehensive Africa Agriculture Development Programme to accelerate growth and reduce mass poverty, food insecurity and hunger in Africa by allocating at least 10 percent of their national budget to agriculture. Oxfam International statistics show that only nine countries have met this threshold. “Ten years later [since the 2003 agreement] Kenya has not managed to allocate at least 10 percent of its national budget to the ministry of agriculture,” Abukutsa-Onyango said. In the 2012/13 financial year, the agricultural budget was 3.6 percent of the national budget, far below the 10 percent threshold. To bridge the gap, there has been an increased donor participation in the agricultural sector, according to ActionAid International Kenya. Yet the ministry of agriculture has been unable to utilise the funds; only 61 percent of its budget from the previous financial year was spent.